Wotan (John Lundgren) and Mime (Andeas Conrad). Siegfried is for me now the highpoint in Frank Castorf’s Ring. It is surely the most difficult of all four parts to bring off, but Castorf’s – and his performers’ – grasp of the work’s epic quality may well be unsurpassed. 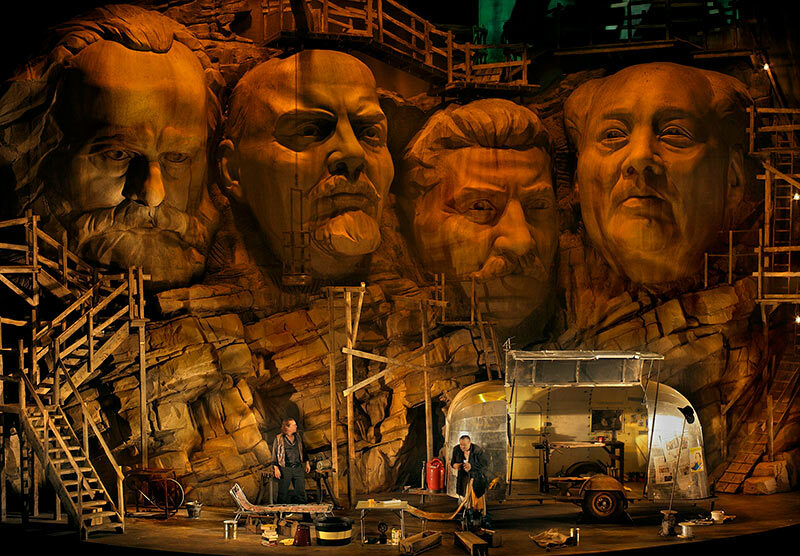 One would at least have to go back – from productions I know – to Harry Kupfer, perhaps even to Patrice Chéreau. In Wagner’s drama, as in Castorf’s staging, so many of the Ring’s strands come together here – and how! A crucial idea to the drama, to its realisation, and indeed to the epic tradition in which it so triumphantly yet challengingly stands is liminality. At a basic, or perhaps better immediate, level, the revolving stage does its work here. Forest or station? Both are quintessential liminal zones. The German Romantic forest has a long history, of course, extending back long before German Romanticism. Think of the invention of ‘Hermann’, a Teutonisation of Arminius: ‘Assuredly he was the deliverer of Germany,’ wrote the admiring Tacitus in his Annals. Arminius ‘had defied Rome, not in her early rise, as other kings and generals, but in the height of her empire’s glory.’ And for Romans, Germans such as Wagner, born in Leipzig in 1813, could substitute the French. Caspar David Friedrich contributed two paintings to an exhibition held in Dresden in March 1814 to celebrate the liberation of Germany from the French yoke, one depicting the imaginary grave of Arminius/Hermann. Wagner too rejoiced in the memory of those events in the Teutoburger Wald, even when he told Cosima in rather gloomy terms: ‘So far, we have been great in defence, dispelling alien elements which we could not assimilate; the Teutoburger Wald was a rejection of the Roman influence, the Reformation also a rejection, our great literature a rejection of the influence of the French; the only positive thing so far has been our music — Beethoven.’ The implication was, of course, that now things might change, although by then the strong, Schopenhauerian element in his world-view was already suggesting they might not. And so, enter the resigned Wanderer, more a hero than the rebel without a consciousness, Siegfried, born in that forest, and ignorant of anything beyond it, might ever prove in reality. Castorf may be understood both to play on that characterisation and to question it. How, after all, could one not, concerned where – indeed knowing where – such Romanticism, even nationalism, might lead, or perhaps better, be understood by some to have led. And so, the fabled alternative Mount Rushmore presents a world in which socialism might appear to have won the day: Marx (great) – Lenin (good) – and then we on the Left do not quite know where to look when it comes to Stalin and Mao. Could we not have Adorno instead? The negative dialectic says no. Aleksandar Denić’s set design for the other side, Bayreuth (Al)exanderplatz station – S-Bahn, U-Bahn, post office, station restaurant, fountain, clock – is too real to be real. It is an astonishing sculpture and again an astonishingly apt liminal foil to the forest. What is more full of transience, more full of possibility, more full of the potential for foiling possibility, than a station? East Berlin seems to be going pretty well, or does it? Or is it East Berlin at all? It is what it is, just as those celebrated crocodiles are what they are. That does not stop us continually asking how, why, what, though. Like Mime, however, do we ask the questions whose answers we really need? Political leaders come and go above on the screens: is that Siegfried; is it Wotan; is it Mime? Or are they just faces of no one in particular, on to whom we (literally) project what we expect, what we want, what we have been led to believe? It is a question as much, perhaps for Honecker as for Merkel, for Lenin as for Stalin. And when actual projections of characters’ faces appear on Mount Rushmore again, what are we to make of them? Does it ‘mean’ anything that we see, or think we see, Siegfried’s face not on revolutionary Lenin or Mao but on ‘establishment’ Stalin, and Wotan (his eye damaged, yet playfully winking) on Stalin’s? Why do we insist on meaning at all? Have we not learned? Is Beckettian gloom perhaps all there is? Maybe, yet there are other possibilities at least here we might grasp. Whether they are better or worse is for us to decide; perhaps Schopenhaurian renunciation would be better after all, but there is no short-circuiting of the question. Our supposed revolutionary hero, Siegfried, is a brutal figure by any standards. His Kalashnikov, heard to terrifyingly loud effect, should give us all pause for thought. Do we think of late Soviet, Brezhnev-era imperialism perhaps (Afghanistan?) or of our own, more fashionable heroes? We still all believe in Castro and Guevara, do we not? Meanwhile, oil continues to do its work; it always has, in West and in East. Patric Seibert, initially Siegfried’s chained bear, is literally covered in it. Alberich is still at large, watching and mocking – like the Wanderer and also like Mime. We draw connections between them; or perhaps we do not. It is up to us. And all the while, those awe-inspiring landscapes and cityscapes, with their wealth of associations, form our thinking, whether we like it or no. Erda initially does not. But she must put on a show. The misogyny here of a newly revivified Wanderer – I am genuinely unsure as to whether the production participates in it, which is perhaps as it is uneasily should be – truly shocks. 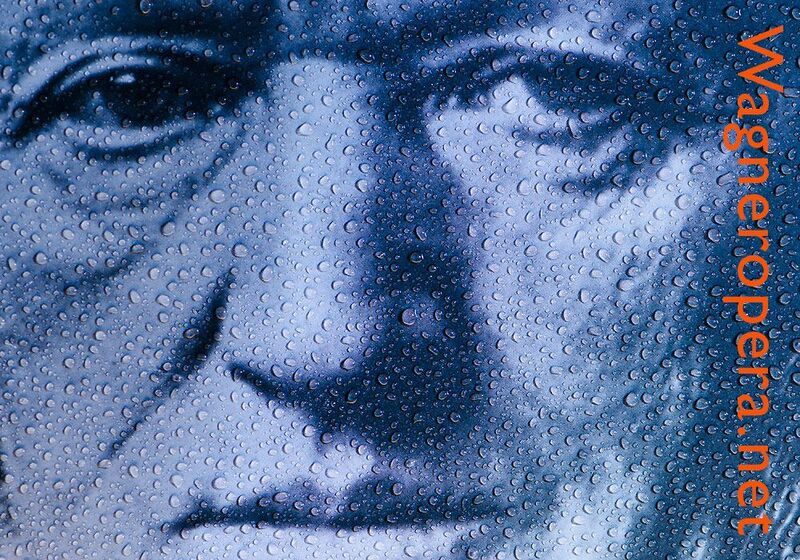 As soon as the tables turn – for Wagner, as soon as Wotan finally rejects Fate, but what does that mean here? – Wotan can treat the earth goddess as despicably as any other woman. There is no redemption for him here in the halting of a wheel’s turning; perhaps instead he transmutes it into post-Russian roulette. Desperate to have a piece of him, Erda debases herself in the now celebrated insistence on fellating the god. His response is to run after Siegfried and to leave her to pay the bill. She has even turned herself into one of his ‘favourite’ blondes, but to no avail. Nadine Weismann, giving a towering dramatic portrayal, quite unafraid to sound hurt, damaged, and cowed, cuts a movingly pathetic figure under the restaurant table at her last. Will things go better for her daughter? Probably not. We fear the worst when she dons her wedding dress, sure that Siegfried will betray her. Our old friend, the Brazilian carnival Woodbird is still around, after all. But in an inversion of what we have seen in previous years, Siegfried returns to her and they embrace. 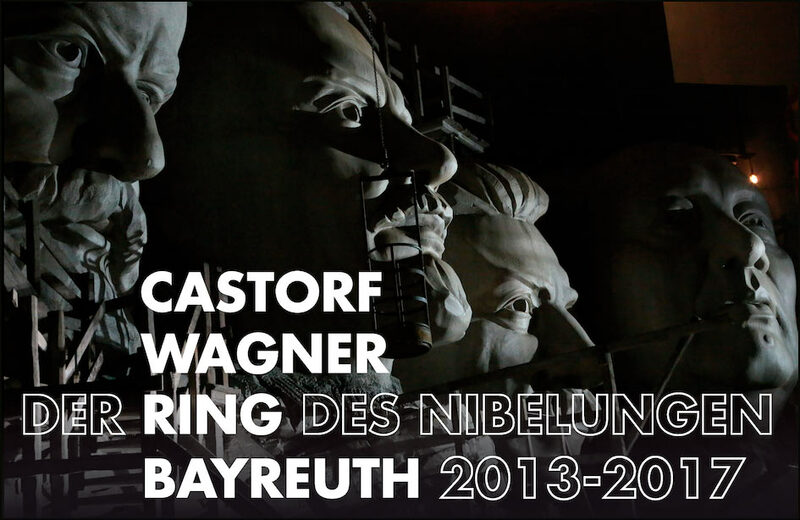 Is Castorf reconciling himself somewhat with Wagner, with Romanticism? I admit that I felt a little disappointed – how much more powerful I found it for Brünnhilde to be left on her own, whilst Siegfried fucked the Woodbird. But perhaps that is the point. Perhaps we now stand at the point at which we need to deconstruct the ‘Castorf Ring’, which, like Wagner’s, we know too well. At any rate, Catherine Foster proved herself in glorious voice, movingly eloquent as events around her coincided with, commentated on her – or did not. She has unquestionably gone from strength to strength. Stefan Vinke, in the title role, proved tireless, if not necessarily ingratiating. But then, how ingratiating should a Siegfried be? When one hears so many singers who are simply incapable of getting through the evening, one cannot but be grateful for one who can, and who continues to be heard. He was certainly unafraid to repel us dramatically; no fairy-tale Romanticism here. Andreas Conrad’s Mime was very much a plausible opponent, heightening the dramatic stakes. 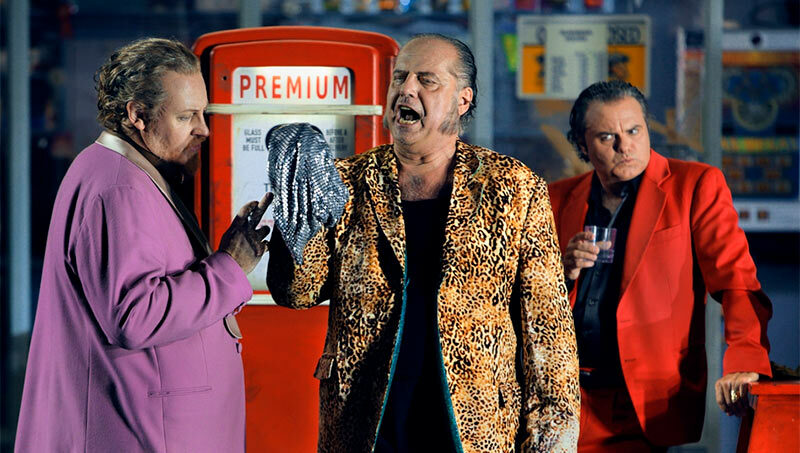 This was a tenor, as well as a character, who demanded to be heard – and was. Thomas Johannes Mayer was perhaps on occasion a little verbally bluff as the Wanderer, but acted the role to a tee. His callous dismissal of Erda, mentioned above, chilled more, I think, than any of his predecessors’. Other singers all impressed in their different ways, very much part of the company. And if Marek Janowski’s conducting of the score was not so alive to its epic quality as, say, that of Daniel Barenboim, or to the great conductors of the past, there was, at its best, a quicksilver dramatic quality to be heard and, yes, to be experienced that had been lacking in swathes of Die Walküre. Was the scene between Alberich and Mime simply too fast, almost glib? Perhaps, but it is not difficult to come up with a reading, in this context, to justify such a portrayal of what Hans Mayer brilliantly dubbed an ‘evil stockjobbers’ satire’. If Karl-Heinz Lehner’s darkly dangerous, still alluring Fafner represented, to quote Mayer once again, ‘the world of shameless wealth, the concentration of capital as a sign of the rise of the middle classes … under which Wagner had to suffer so much,’ then there is again something to be said for a lack of majesty to his prowling around the station. So long, that is, as it retained musico-dramatic coherence, which it did; Janowski certainly knew where the score was going, even when he seemed a little impatient with it. Perhaps, then, that will prove the most intriguing dialectical legacy of all from Castorf’s Siegfried: seemingly having held the work to sometimes extreme account, it vouchsafed the possibility, even the plausibility, of new musical readings too.